I can't tell you how many times I answer the question "What the heck is a FiGPiN, and what makes it different from a normal pin?" Well, today we are going to delve into that question and ferret out all the details of this very special pin offering. It would be very easy to dismiss them as a standard, ordinary collectible pin. That would be doing the product and yourself a disservice though. FiGPiN's where the brainchild of a few guys that were crowded around a table full of standard enamel pins, and asked the question of themselves "can they be more than just pins?" That began a long exploration into what made pins cool, why did people collect them, what did they do to display their pins and how did they store them when their backpack was covered within an inch of its life with pins? Now you've got to understand, this is an exploration taken up by a group of guys that were collectors themselves - so you know there were asking the hard questions. Erik Haldi, the creative director at FiGPiN, was quick to tell me that the art is the lynchpin of a great pin. Even more important is starting at the silhouette of the pin. He works very hard to make sure the silhouette is distinctive enough that you can usually tell who the character is just from that initial form. Once they nail the outline of the form, then they dive into the likeness and interpretation of the original character. The artists that work on the designs are dedicated to ensuring accurate representations of the characters and strive to elevate the art so that the depiction on the pin is the best it can be. Even at the factory, they take the notion of "the best art possible" very serious - even using specialized tools to ensure the proper placement of the colors in the FiGPiN's color wells! In the world of real estate, it might be all about location, but in the world of collectibles, it's all about being able to display and store your collectibles in a pleasing and safe manner. Rather than stick your pins in an ugly brown corkboard - FiGPiN's gives you two options to display your valuable collection! First, there's the pin backer that doubles as a display stand. This ingenious design makes it very simple to take your pin off your Vault-Tec hoodie and instantly stand it up on your desk. No fuss. No tools. No extra gadgets. Just stick the pin backer onto the FiGPiN and...well, it's a built-in stand! Perhaps you're looking for long term storage or more protection? FiGPiN has you covered there too. Each FiGPiN comes with its own jewel case, complete with backer art! Simply pin the FiGPiN to the attached post in the box, slide the backer card into the jewel case and you have an instant and classy display stand with tons of protection. They have their own app? In fact, that is just the tip of the iceberg. Erik divulged a list of updates they are working on for the app to increase the usefulness and value of the app. I'm not at liberty to divulge the details right now. But later this summer should be big for FiGPiN collectors! FiGPiN Mini's are approximately 2" tall. Despite their size, they still pack all the same great features of their larger siblings. FiGPiN's are approximately 3" tall and were the original design for the FiGPiN brand. Larger than standard pins, but still able to be worn or displayed on your favorite piece of apparel. FiGPiN XL is the giant of the bunch. Measuring a whopping 6" in size! Perfect for folks looking to make a statement with their pin collection. 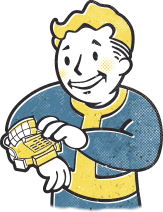 FiGPiN's has created each of the Vault Boy perks as a collectible FiGPiN. Each pin is limited to 1000 units - so once they are gone, they are gone for good. The Bethesda Gear store has released one each month. In March, we released Charisma FiGPiN, and coming April 2nd, we will be releasing the Intelligence FiGPiN. Check out the full collection of Fallout FiGPiN's on the Bethesda Gear store.